I visited the DMV last Tuesday to investigate why my new license hadn’t arrived yet, and this may sound surprising, but I had a wonderful time. Maybe wonderful is a slight exaggeration, but it was pretty close. What I appreciate about the DMV most, is the people who work there. Every person I have encountered over the twenty-three years that I have been driving has been helpful, thorough, and kind. Meanwhile, what I enjoy most about the DMV, is every customer inside those walls is humbled by the fact that they have to be there. We all need ID in this country; most of us need/want to drive and fly, and the DMV is the mandatory stop on the way to those glorious freedoms. A trip to the DMV is the quintessential reality check, we are forced to step out of our comfort zones to accomplish the task at hand in order to be able to do what we really want to do, and go where we really want to go. Thankfully, my issue was fairly easy to fix, they delivered my license to my street, but they did not include my address. Odd, but I just needed to follow a few steps on their database by using their computer set up in the testing area, (it was nerve-wracking standing next to people who were on the precipice of freedom or failure, to drive or not-to drive). Moreover, once I filled out the necessary information, the kind, yet slightly “know-it-all-ish” twenty-something employee printed out my interim license and I was on my way. Wa-lah. About seventy-five minutes after walking in, I was walking out with a license in my hand and a renewal for humanity in my heart. I think we could accomplish so many more of our goals if we had to go through a metaphorical version of the DMV to achieve them. What if it was possible to have a step in our stories that would be annoying, exhausting, and time-consuming to reach, yes, but once we crossed the threshold, waited for our number to be called, stood-up and communicated our requests calmly to the employee across the counter, our request would be processed with a respectful gaze, and we would be sent on our way holding in our heart what we came there for. I believe there is such a thing/place/step in the process, etc., but often times we don’t want to take the time and deal with the drudgery involved to reach it. Then again, what if we shifted our gaze and viewed those annoying tasks as fun challenges that helped us reach what we wanted, verses distractions that steer us away from our goal entirely? Our excuses are the real distractions. We can’t hide forever, or keep trying to find an easier way; there is only one way to reach the counter of this magical DMV I keep rattling on about, work. Work hard. Pay attention every day to the details before, during, and after every task is complete, and then learn, and apply those lessons to the next task. Some may be successful the first time out, some may not, just remember to relax, reset and keep going. Every step forward is a step in the right direction. For example, last week I had a huge boost in my training load, and I lOVED it! 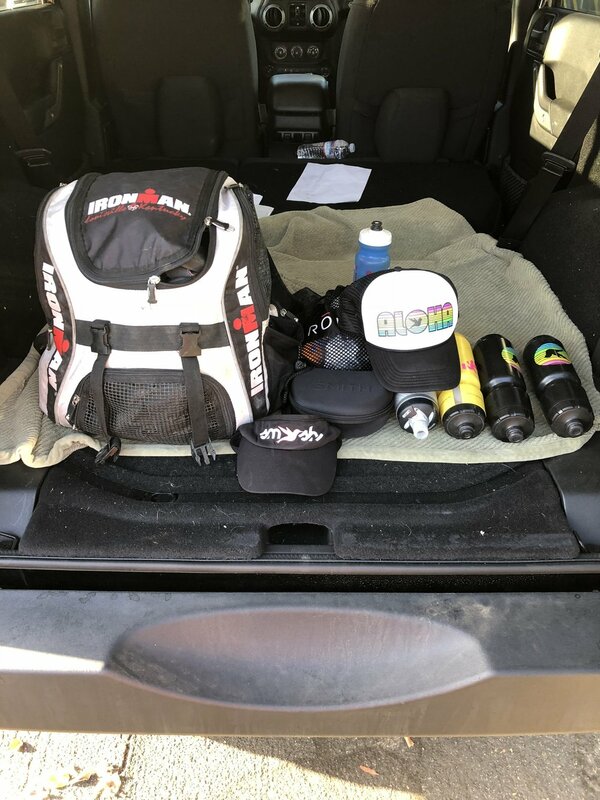 However, even though I usually have the ability to absorb an increase in volume, and rarely fail or mark “incomplete” on my training log, last Thursday I did. I bombed one of my favorite treadmill runs. That entire night I wrestled with the shame involved in quitting, and the truth that the added fatigue had caught up with me, and that stopping was the right choice. Nevertheless, what I was truly nervous about was that my coach would cut back on the staggeringly difficult workouts planned for the weekend, nope, those workouts stood firm. Yes. The plan for Saturday was lovely. Testing out my new ROKA Viper swim skin. Photo courtesy of Madora Pennington. I swam in the ocean for the first time since the Pier To Pier race with my favorite open water group, SMOG, and then rode the famous Palos Verdes switchbacks a few times, and finally ran a handful of miles at goal Ironman pace. I felt good the whole day, and was grateful that any lingering discomfort from Thursday had melted away. I was back to feeling like myself. A surprise mid-ride rendezvous with my my dad. Saturday’s training was a treat, but the really tough workout was slated for Sunday. I decided to run this workout in Claremont, because, A.) 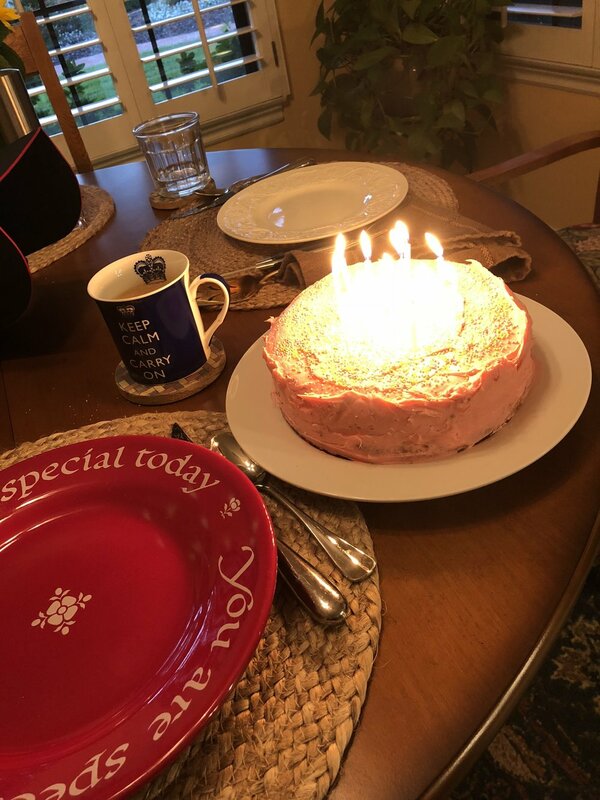 I wanted to see my mom, (she made a vegan version of my strawberry birthday cake for an initial meet-up planned for Tuesday, but since I was stuck at the DMV, she froze it, but it would be thawed out and waiting for me to devour if I survived this run. B.) I needed to be on a track, and I have zero access to any tracks around my house. I used to run at the nearby high school on Sundays, but the grounds keeper kicked me off the last time I tried, and said I needed a permit. So, I headed out to my failsafe track, my alma mater, Claremont High School. I ran track when I was in high school, but I was a stubborn sprinter, hurdler, and jumper, (both high and long), and I steered clear of long distance events, but the one event that I tried to stay the farthest away from was the 800m. The 800m event is a half mile, aka, two laps around the track. It is a perplexing distance to crack, because it is not an all-out sprint, nor a true long-distance, it is both, so it requires a deft balance of both speed and endurance. I only “raced” it when I participated in the annual Pentathlon our school hosted, (it was the last event of the day), and I ran it poorly both my Junior and Senior year. Surprisingly, even though I jumped from sprints in my youth to marathons as an adult, I have still managed to avoid running the 800m all these years, until this year. I ran more 800’s on Sunday than I have my entire thirty-nine years on this planet put together. The workout I whined about a few weeks ago that I poorly executed is the puppy version of the big dog I ran on Sunday. This monster 800 workout was my metaphorical DMV. I poured over the details of the workout before I started, determined to not mess it up this time. The first few intervals were slow, my legs and bod were creaky from the heavy week of training, but then I found my rhythm, and clicked off 800 after 800 at the prescribed speed, and felt awesome. I felt calm and strong, like I do during the early miles of most stand-alone marathons, but about halfway through the set my speed started to wane. This phase is typical during most marathons, especially during an ironman, it is tough to stay on pace the entire 26.2 miles, but it is during these plunging moments of discomfort and shaken confidence that the real work begins. It is how we mentally crawl out of that plunging hole that turns it all around. When my speed starts to fade during a marathon, I can lock in on a pace and stay there. It feels like that scene in a movie when the lead character is dangling over the edge of a building holding tight with both arms, and then one arm drops, and they cut to a POV of the street below, and then a close-up of the character, and then suddenly they thrust their weight up and grab the ledge with their other hand and hold on tight and steady themselves again with both arms, and slowly lift themselves back up to safety. During the latter miles of a marathon, when my earlier speed is gone, gobbled up by starved exhaustion, I never worry, because the fight to continue to finish has nothing to do with muscle strength, it gushes from my head and heart. I had my one-arm dangle 800’s about halfway-through the workout, but the joy and amazement that I was actually doing this legendary workout, overwhelmed the fatigue, and I was able to steady, and then slowly increase my pace to finish it feeling satisfied, and ready to face whatever comes next. Sitting in the back of my Jeep, letting it sink in that I just completed the hardest workout of my life. Also, after a swim and another run, I did get to indulge in my favorite strawberry cake.